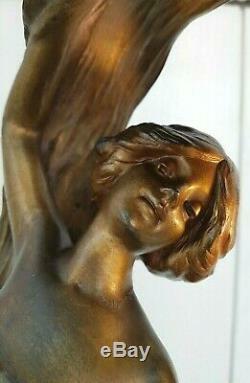 Jugendstil Art Nouveau Loi FULLER table lamp. 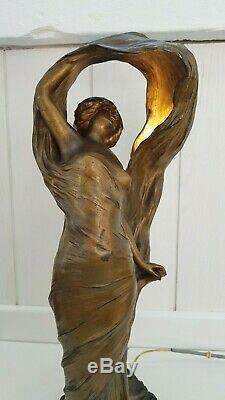 Antique 100% ORIGINAL vintage spelter figural sculpture. 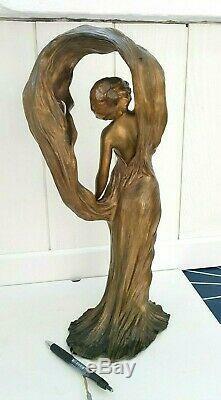 Stunning antique table lamp from the beginning of the century. 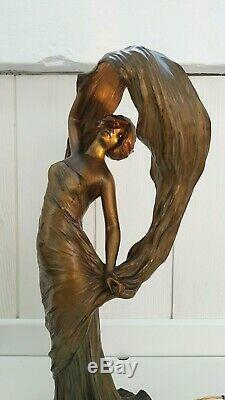 This stunning art nouveau lamp is an incredible piece of work by famous french sculptor Lucien ALLIOT. This lamp is a perfect synthesis of the Art Nouveau spirit, and a vibrillant hommage to the famous american dancer Louie Fuller, who became a muse for several artist of this period. 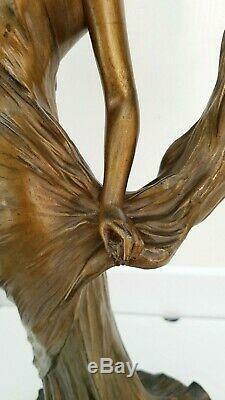 She is showing performing her famous Serpentine dance which turned her famous. The sculture has a hidden small screw socket for a bulb, creating a nice diffuse lighting enhancing the shades and facial features. The details and especially the drapped of the dress are just incredible. 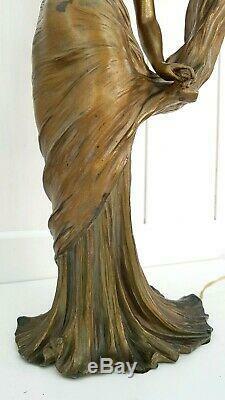 This is the perfect combination of a highly detailed sculpture and a perfect casting. The statue itself is in very good condition, with beautiful original vibrant and shinny patina (even better than visible on the pictures I took). 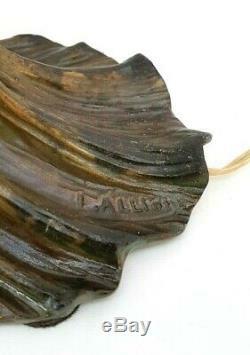 \ However, it is to note that there are some thin cracks, and especially one (the largest) on the neck base. 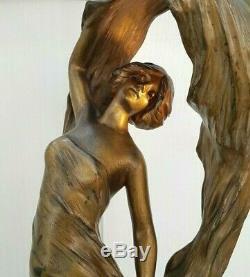 Barely visible but present (see pictures).. All in all, this is an amazing antique piece of Art Nouveau in very good average condition. 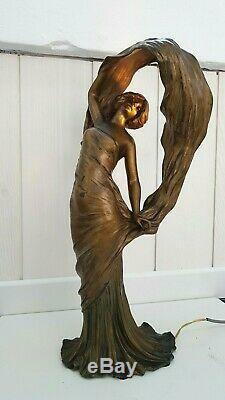 ==> I have another bigger art nouveau floor lamp by the same artist for sale: see my other items. 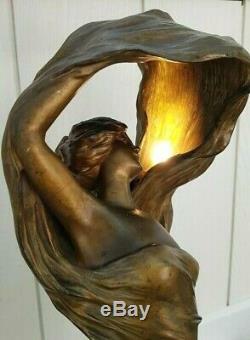 L'item "Antique French Jugendstil Art Nouveau Loïe FULLER Spelter Bronze Lamp L. ALLIOT" est en vente depuis le mardi 9 avril 2019. Il est dans la catégorie "Art, antiquités\Meubles, décoration du XXe\Design du XXe siècle\Eclairage, lampes". Le vendeur est "*troglodyto*" et est localisé à/en Lille. Cet article peut être livré partout dans le monde.